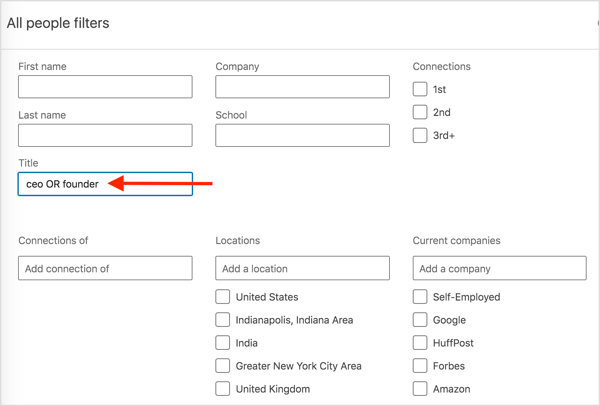 In this article, you’ll learn how to use Boolean search with LinkedIn’s Advanced People Search to reveal your perfect prospects. 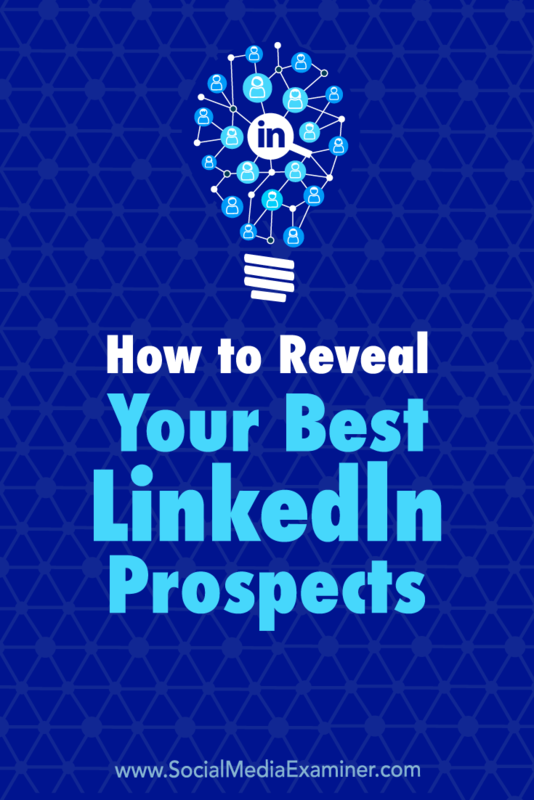 How to Reveal Your Best LinkedIn Prospects by Josh Turner on Social Media Examiner. Before you start searching for prospects on LinkedIn, you need to have a clear understanding of whom you’re trying to target. 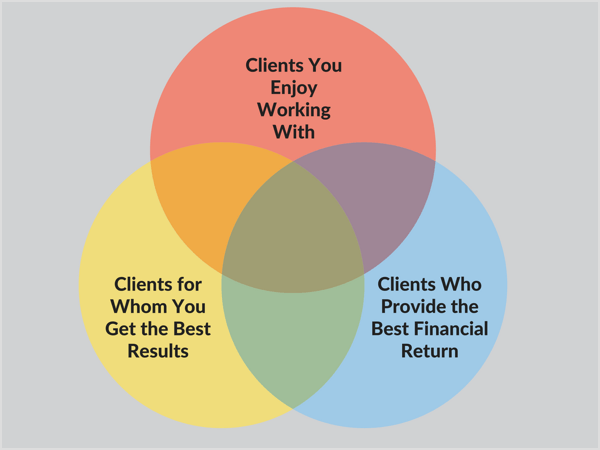 Think about the clients you most enjoy working with, the clients to whom you can give the best service (and get the best results for), and the clients that offer a greater financial return for your business. Finding prospects at the intersection of these client types is the best and fastest way to grow your business. Remember, it’s one thing to simply find prospects and another to attract the best prospects for your business. Zeroing in on your ideal customer saves you time and money in prospecting and selling. and moves your business forward. To build an advanced prospect profile, you need to identify a number of client attributes. Note your ideal prospect’s job title, industry, company size, and company revenue. Make a list of a few specific companies and/or people in those companies to use as your avatar. Describe your prospect’s pain points. Determine what actions they’re already taking to relieve those pain points. You need to know where your ideal prospect hangs out already if you want to get in front of them. It can be helpful to create a chart like the one below to keep track of what you find or note this info in a spreadsheet (more on that later). 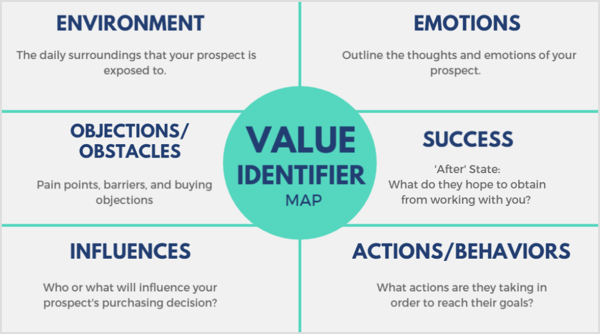 Use a value identifier map to determine what your prospect values most, what environments they’re exposed to on a regular basis, and what influences them. 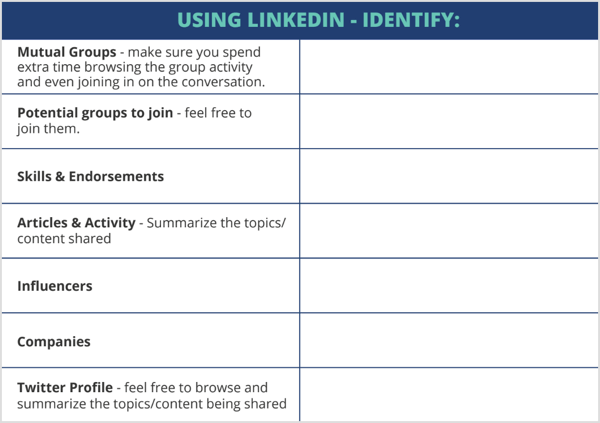 Once you’ve finished compiling your prospect profile, you’ll not only have a more complete image of your prospect, but you’ll also be able to perform targeted searches on LinkedIn. The best way to search for LinkedIn members who match your prospect profile is to use the platform’s search filters in conjunction with Boolean logic. Boolean logic is an algebraic system of showing relationships by using two variables that are denoted as “true” and “false.” In other words, it lets you combine or limit search terms for more detailed and exhaustive searches. Best of all, you don’t need to upgrade to a premium LinkedIn account to get super-specific search results. LinkedIn supports five Boolean search operators, each limiting or adding to your search in different ways. Here’s what they mean and how to use them. To get results that include two or more terms in a list, add the word AND (in all caps) between the items. For example, suppose you want to target people involved in Facebook marketing. You could type “marketing AND Facebook” in the search box. The search results will include people who have both of those terms in their LinkedIn profile. To see results that include one or more terms in a list, separate the terms with the OR operator (in all caps). For instance, type “sales OR marketing” to search for people who are in sales or marketing. To exclude a particular term, add NOT immediately before the term. To visualize this, type “president NOT vice” to see people with “president” in their job title while eliminating vice presidents. To do a complex search, you can combine terms using parentheses. To search for an exact phrase such as a title with multiple words, simply enclose the phrase in quotation marks. To illustrate, add quotation marks around the term “product manager” to find people who have that phrase in their profile. If you don’t use quotation marks, you’ll get results that include people who have the term “product” or “manager” in their profile. Note: LinkedIn search only supports standard quotation marks. Other software or websites may use special symbols that LinkedIn’s system doesn’t recognize. To optimize overall site performance, stop words such as “by,” “in,” and “with” aren’t used. So far, all of the examples are searches in the general search bar, which will look for general information from your prospects’ whole profile. To take your targeting to the next level, use LinkedIn’s Advanced Search. LinkedIn allows you to narrow your search to a specific place within a user’s profile (for instance, the job title or company), ignoring the rest of the profile. There are two ways you can do this type of filter: Advanced Search filters or LinkedIn’s search operators. To use LinkedIn’s filters, click All Filters on the search results page. You then see the All People Filters page, shown below. Now enter your search details in the appropriate field. To visualize this, if you want to search for people who have either “CEO” or “founder” in their job title, enter “ceo OR founder” in the Title field and then click Apply. Just type these commands in the search bar followed by a colon and then your search query. Don’t use any spaces in your search query. Note: You can use all of the above techniques with a free LinkedIn account to pull ultra-targeted search results and begin connecting with your best prospects. However, LinkedIn does limit the number of searches you can do at one time with a free account. For additional search filters and a higher volume of prospecting, consider upgrading to Sales Navigator, which starts at $64.99 per month (when billed annually). Getting familiar with and using Boolean logic in your searches not only saves you time (since you can do everything from the search bar), but also gives you very specific and targeted people you can connect with and nurture into leads and clients. Monitor your database build conversion rate. Track people to whom you’ve sent connection requests. Before you create your tracking sheet, first make a list of the details you need to track. Then create a spreadsheet in a program like Google Sheets or Excel. Add columns for the data you want to track such as search terms, links, and where you left off with your prospect. As you connect with more prospects, you can refine the data you track. You’ll start to see a pattern of which prospects respond to what messages. And when you reach out, you’ll never be confused or embarrassed by forgetting a prospect’s name or your last conversation with them. 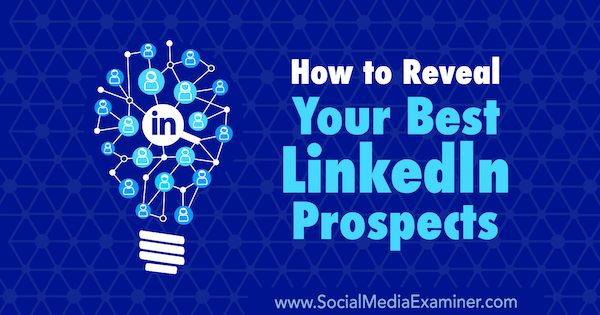 Once you’ve got your prospecting down, you’ll also make sure you have a well-positioned LinkedIn profile that converts more prospects into connections. What do you think? Do you use some of these search tactics to find prospects on LinkedIn? How do you track your outreach to prospects on LinkedIn? Please share your thoughts in the comments below. Josh Turner is a Wall Street Journal bestselling author & founder of LinkedSelling, which has appeared on the Inc 500 two years in a row. He is a leading authority on LinkedIn.